Underneath the joys and adventures of Mira’s life she knows the truth of the fact that everything she loves is disappearing and that fact is daily coming into clearer focus. It’s not only the ordinary losses of physical skills, aging friends and relatives, material objects past their use by date, but in this time she senses we are witnessing the very end not only of our hard won freedoms but even of ourselves as a species. 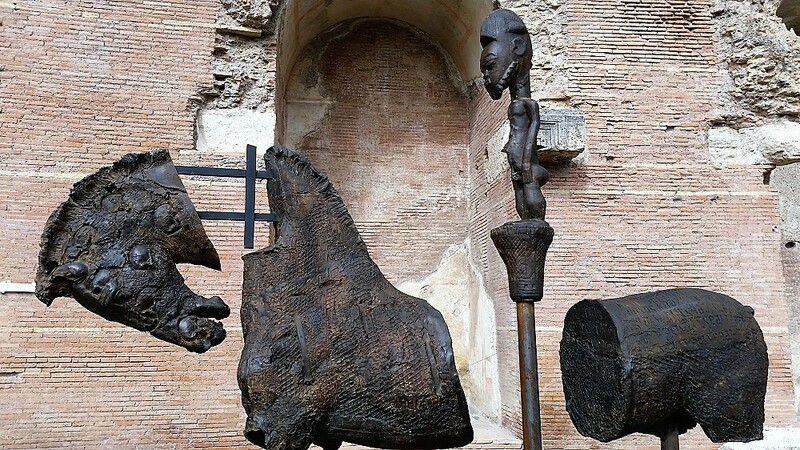 The artwork in this chapter is street art from Rome and Paris mostly unknown artists but also William Kentridge's Rome wall stencils and horse sculptures from an exhibit in the Diocletian Baths by an unknown sculptor. The funny thing about this, and yes she can find humor, is that she realizes that her kindergarten self knew this, as do all kindergarteners. They know that the world is finite, as large as it may seem to them, and that you can’t keep over consuming and growing without something big going “pop” without the stuff getting all used up, without drowning in trash. And if the bullies take all the cookies and toys, even they will also eventually succumb to nature. Though her family in Canada are liberal and open minded, growing up she sensed a cultural taboo about speaking aloud about this knowing. The complicity of keeping silent was the curtain they all hid behind, pretending the boogey man couldn’t see them. Mira sees that the curtain has only become denser the closer we approach radical upset and it’s become a curtain that sadly divides us as well. She loves science and scientists, her nerdy husband is exhibit A with his day being made or ruined with understanding or lack thereof of a mathematical concept. The brilliance of not only discovering and seeing through numerous telescopes at the full spectrum of wavelengths the magnificence of neutron star collision, and having the mathematics from a hundred years ago to predict such an event is truly a breathtaking achievement of our species, as is a Bach Cantata, an ordinary smartphone, or a functioning democracy. And yet she sees the same intelligence and even seeming magic that creates and exposes such beauty as brought to its knees in the face of the imminent demise of all of us as well as countless other species. She senses that as the evidence of intelligent life increases in achievement so seemingly does it’s ignorance of or ability to apply cautionary brakes to its will and arrogance. She wonders, if millennia ago we hadn't set ourselves apart from nature making our needs central and primary, would we be looking at different circumstances? The ennui, the giant yawn of inaction with which her species faces the predicament, for it is far past the stage of a problem with a fix, is the most breathtaking phenomenon she has witnessed in her life. It plays out daily in her own small life as well as what she observes locally and globally. Mira has no answers, no blame, no solution, no hopefulness, no hopelessness, no resolution, no sense of finality, and yes she feels guilt and shame in difficult moments realizes this to be unhelpful. She is curious about the fact that simple joys not only still exist, but are magnified by this knowing, this view from the brink. It gives her permission to halt many active pursuits and relish the being of moments, the feeling of sensing the world through her wholeness in the ordinary events of a day in her little valley side corner of this jewel of a planet. She notices the connection she has with pain and suffering of other humans and species near and far, the visceral embodied experience that is evanescent because of its impersonal nature, at least for now. On good days she has a sense of dissolving, as if the created story of her, the personality, the factual vitals of a lifetime are dropping away, disappearing like sugar in tea, slipping beyond her perception, while inner knowing brightens. She has no illusions that our ending will be so sweet but does hold the preference that despite contrary evidence the species will find the fierce love and generosity necessary for the impossible road ahead, the will to care and carry when there is little else to do.